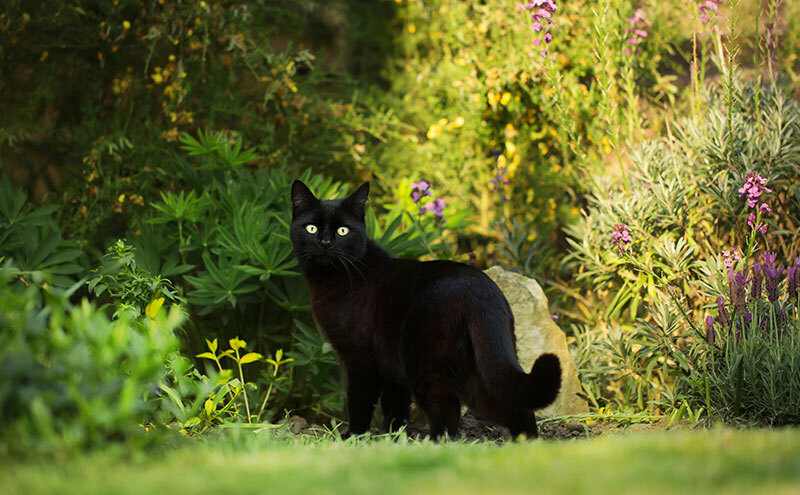 Cats can be adorable and pleasant creatures, but they can also damage your garden. To the feline mind, a garden is just a big, outdoor litter box. Coming across a pile of fresh or dried cat feces can be a little off-putting and take the fun out of your yard. Cat poop can also contain pathogens that can contaminate the soil and even make you ill. Fear not, there are some safe, natural, and humane strategies that you can use. With the right home remedies, you can stop these furry intruders from using your garden as a personal toilet. Repel Cats With Strong Odors. Let’s look in a bit more detail now. Cats have around 80 million olfactory receptors. This makes them incredibly sensitive to strong odors. By spreading pungent scents about your garden, lawn, and flower bed, you can keep them from filling the area with poop. Cats are not fans of the odor produced by mothballs, so if you place them around the specified area, traffic from felines is likely to decrease significantly, if not cease entirely. Mothballs are a fairly cheap and simple solution, but they can be toxic and carcinogenic to both humans and animals alike. Since these drawbacks can make them far from an ideal means of kitty control, it is best to avoid using them if at all possible. There are safer and more natural alternative to mothballs can be fresh cab, citronella, and dried Ruta. Strong odors like these tend to irritate and overwhelm their senses, but unlike the mothballs, they will not pose a significant threat to you or the cats. A common strategy used to prevent cats from leaving waste in gardens is to bury the peels of oranges and other citrus fruits. This will not only keep cats away, but it will make your garden smell pleasant and nourish your soil. The peels of citrus fruits have natural antimicrobial properties, which can help mitigate the growth of fungi and bacteria that can damage your plants. A fairly primitive tactic of deterring pests is to spray animal urine around your property. The urine used to repel cats generally comes from predator animals like wolves, coyotes, and foxes. This scent does not repel felines by overwhelming their senses, but by playing off of their self-preservation instincts. Cats, like most other animals, would prefer to avoid encroaching on the territory of animals that could pose a mortal threat to them. The obvious drawback of this method is that the treated areas would smell like strongly of urine, which is likely the exact opposite of what you would want. There are a lot of anecdotes from gardeners and pet owners that claim certain plants are able to repel cats. Ruta, lavender, rosemary, lemon balm are believed to have the desired effect, as the odors they produce are unpleasant to felines. By planting these plants around and within your garden, you may be able to prevent the neighborhood cats from planting their putrid pellets. Check out this post for herb garden ideas that might help with cat mess. Given how sensitive cats are to sound, high-frequency noises are capable of keeping them away from your garden. There are motion activated alarms that produce sounds that are unpleasant to cats, but inaudible to humans. Though this is not a natural solution, it is effective and has few drawbacks. These are perhaps the most effective way to stop cats and other animal making your garden their own toilet. The downside of this method is undoubtedly the price. If you have a large garden it’s going to be expensive to protect your entire property this way. You can move the sprinkler around the garden so that gradually the cats will learn that no area is safe for them. Check out this Hoont Water Jet Blaster on Amazon to see if it’s right for you. Cats love soft and loose soil or mulch, as it allows them to easily bury their excrement with little damage done to their sensitive paw pads. This is why cats love gardens. The well-tended earth is ideal for them, but there are ways to make your garden much less inviting. Cats do not like prickly surfaces, which is why placing cuttings from rose bushes around your plants can keep them away. The rose thorns can hurt, but they will not likely cause significant injury to the invasive creatures. Felines do not like walking on or digging in pebbles or gravel, thus incorporating these into your garden, lawn, or flower bed can keep cats away. Pebbles and gravel can also serve as a nice bit of decoration, providing a Zen aesthetic. Gravel can allow for proper water drainage, protecting your plants from drowning or rotting during periods of substantial precipitation. You can also place flagstones or rubber slabs to protect your soil from cat droppings. You will be able to freely move the slabs while working in your garden, but cats and other pests will be unable to dislodge them. If they are unable to do their business in your garden, they will likely go elsewhere. In order to make your garden less inviting to trespassing felines, you can bury stakes, toothpicks, forks, and sticks. These objects can function as mild impediments to their digging, which interrupts their pattern. However, these can also be a slight nuisance to gardeners and installing them can be somewhat time-consuming. There are prefabricated spiked, rubber mats that can accomplish the same goal as the objects mentioned previously. Building barriers around your property can protect your garden from cats and their disgusting little presents. While it is possible for cats to scale great heights with little effort, an additional guard may be enough to deter them. Cordoning off your garden with chicken wire can serve as a barrier sufficient to keep cats away. Cats are fantastic climbers, but they do not like climbing on chicken wire due to its texture. If you want to keep them out, you can attach the wire to 3 to 4-foot tall posts around the desired area. If you are working with chicken wire, wear thick gloves and goggles to protect your eyes and hands from the sharp edges. Chicken wire can also be placed on the ground, which can also serve as a cat deterrent. Perhaps you do not really mind cats on your property in general and only want to keep them away from your garden, planters, and flowerbeds. If that is the case, you can try creating designated waste zones. This can be done by transporting cat waste to a particular region, and making that space more inviting with soft soil, valerian, catnip, and long grass. If you do this, cats will be far more likely to leave your garden alone. No one likes to find their garden beds covered in cat poop. Their feces can be riddled dangerous parasites and bacteria, potentially exposing you and others to disease. You can use some of the safe and humane strategies outlined above to keep cats from wreaking havoc on your garden, flower bed, and yard. I hope that you have found this article helpful.